The Processing tab allows you to create and manage purchase orders that are waiting to be processed. Processing purchase orders are those that have been drafted, submitted, or accepted by a distributor, but has not yet been received and closed by a user in your warehouse. Backorder report: This allows you to quickly see which items in your processing purchase orders are still waiting to be received. Send purchase orders: This allows you to quickly e-mail the selected purchase orders to their respective distributors. Each e-mail will list the items being purchased, the rates and total price, and other details. Print purchase orders: This allows you to quickly print out paper drafts of the selected purchase orders. The drafts will feature barcodes that you can scan to open the Purchase Order page. Delete purchase orders: This allows you to quickly delete the selected purchase orders. Unlike closing a purchase order, this will not receive the purchase order's contents into inventory — instead, the quantity being ordered will be removed from each item's Incoming count. Bulk status change: This will quickly change the processing status for the selected purchase orders to the status of your choice. Create purchase order: This allows you to quickly create a new purchase order from one of your stores to a distributor. If you have not done so yet, you can add your distributors in the Distributors tab. 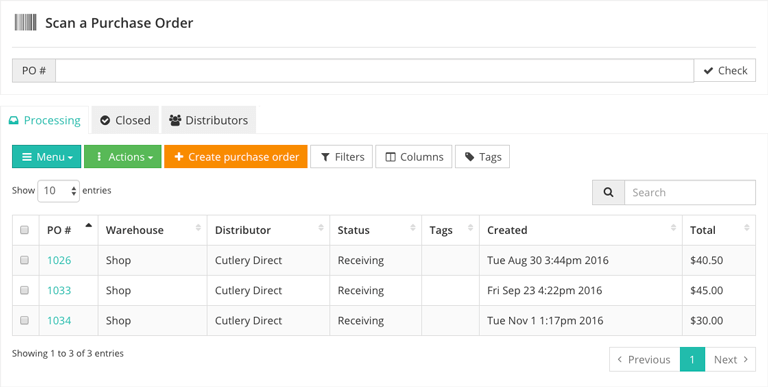 Filters: You can filter what is shown in the purchase orders table by distributor. Tags: You can add tags to or remove tags from selected purchase orders by toggling the tags in this menu. Select Manage tags to add or edit available tags. Search: This allows you to search for purchase orders by their distributor, creation date, and more. PO #: The unique identifier that was manually entered or automatically generated when the purchase order was created. You can receive or manage a purchase order by selecting its PO # and going to the Purchase Order page. Warehouse: The warehouse for which the purchase order was created. Distributor: The distributor that the purchase order will be submitted to. You can manage your distributors in the Distributors tab. Status: This indicates whether or not the purchase order has begun the process of receiving. Tags: Custom tags can be created and added to purchase orders. Tags can be labeled however you choose, and can be used for various organization needs. To add tags to a purchase order, toggle the checkbox on the purchase order's row and toggle the desired tag in the Tags menu. Created: The date and time that the purchase order was created. Creator: The user account that created the purchase order. # units: The total number of items that have been added to the purchase order. Total: The total value of the purchase order based on the items being ordered and their submitted wholesale prices. Dropshipped: This indicates whether or not this purchase order has been dropshipped. Dropshipped purchase orders are created through an order's Purchase Orders panel.